“Our bugs are the best in the business,” Dean Kegler of ZeaChem declares proudly. I’m touring one of the country’s first experiments in cellulosic biofuel production, a demonstration-scale refinery in the small industrial port town of Boardman, Oregon. The bugs in question are high-powered naturally occurring bacteria whose sole mission in life is to ferment sugar into acetic acid — on the way to becoming fuel-grade ethanol. The bugs’ sources of sugar: woody biomass from locally farmed poplar trees and wheat straw from area farms. The facility is expected to start production utilizing wood chips by the end of 2012. The fuel’s ultimate destination: passenger vehicles. I glance around the facility with curiosity, wonder, and a bit of skepticism. Am I looking at the future? ZeaChem will use wood chips to create biofuel. Photo courtesy of ZeaChem. Biofuels stand as one of the most promising, though controversial, alternatives to fossil fuels such as petroleum, coal and natural gas. The question of dependence on fossil fuels sits at the crossroads of environment, land use, and national security concerns. Everybody knows that the United States’s consumption of ever-greater quantities of fossil fuels for energy – in other words, our addiction to oil – is a major factor in global climate change. But our need for ever-growing volumes of imported fuels from politically unstable or totalitarian countries is also destabilizing: our purchases at the pump prop up unfriendly regimes with disastrous human rights records. However, the potential for increased food-based ethanol production presents two important environmental and social challenges. First, the use of valuable agricultural land for fuel crops leads to the potential for increased food prices. Second, the land use conversions that arise from increased food-based ethanol production leaves open the possibility of increased international total greenhouse gas emissions, despite the lower emissions coming from vehicles’ tailpipes. Cellulosic biofuels appear to be a different beast than those based on corn. Raw material for the fuel comes mostly from wood chips and agricultural waste, rather than from food sources. And the International Energy Agency (IEA) estimates that the fuel generates 70% to 90% emissions reductions compared to gasoline. However, the technology for refining wood and farm waste into energy has proven difficult to develop. To make cellulosic ethanol, the cell walls in plants must first be untangled, and sugars must be extracted from the cellulose through a multi-stage fermentation process. Here’s where ZeaChem’s world-class bugs come in: the little guys are enlisted to ferment the sugars into acetic acid, an intermediate chemical, which can be converted into ethyl acetate and then into ethanol in the final step of the process. Still,there are some bigger questions that ZeaChem and the cellulosic ethanol sector have to answer on their march to independence from fossil fuel. The first is stability of inputs. Will the feedstock supply be disrupted due to climate change, natural disasters such as droughts and hurricanes, or even economic fluctuations such as recessions? Second, the question of scale arises: due to economies of scale in the refining process, the future of biofuels seems to lie in large-scale, relatively centralized production and distribution. Will the large-scale nature of the production process leave dreams of a widely distributed, autonomous energy system in the dust? In any case, what’s clear from the evidence – and my own experience at ZeaChem – is that the rapidly developing field of biofuel technology is worthy of any social change advocate’s rapt attention. On question #1: ZeaChem’s feedstock strategy focuses on risk mitigation, which reduces the dangers raised in the first question. ZeaChem’s refining process can use multiple types of feedstock, allowing the company to source biomass sustainably and locally, within a 25-50 mile radius of the refineries. This feature of the refining process keeps transportation costs low and thus makes production costs competitive. It also reduces the company’s exposure to price fluctuations: if the price of one feedstock spikes, we can switch to an alternative feedstock. 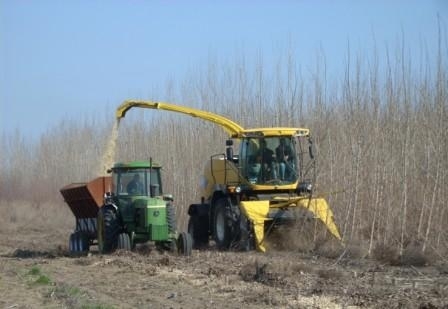 Dedicated energy crops, such as poplar trees, will supply the majority of ZeaChem’s feedstock, with locally available agricultural waste acting as a supplement. ZeaChem has secured a long-term, fixed-price contract for its feedstock with GreenWood Resources, owner and operator of a local poplar tree farm. The contract will provide ZeaChem with feedstock through the demonstration scale and 1st commercial biorefineries in Boardman. ZeaChem’s long-term contract with GreenWood Resources will reduce the potential for disruptive price fluctuations to impact ZeaChem’s operations. On question #2: Biorefineries will be located where there is market demand for the biofuel. A benefit of ZeaChem’s location for its demonstration and 1st commercial biorefinery in Boardman is that there are multiple transportation options for cellulosic ethanol to be transported to market. The sites at the Port of Morrow are located on the Columbia River and an existing ethanol barge load-out dock is already in place. Barge transportation is a very efficient and economical way to transport goods to market. From Boardman, ZeaChem’s cellulosic ethanol can go to refineries up and down the west coast to be blended into the gasoline pool. The sites are also located inside of a Union Pacific rail loop and Interstate I-84 passes just to the south.